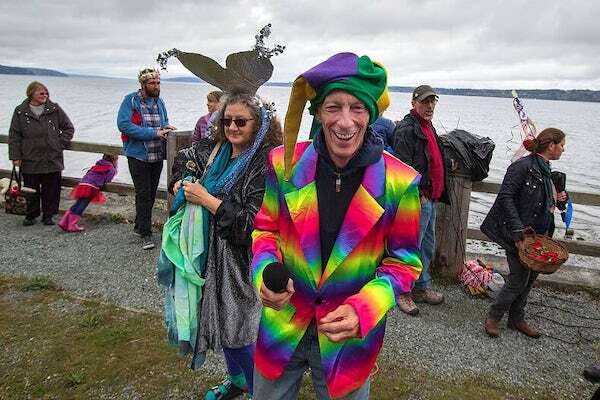 Jim Freeman in rainbow, celebrates the arrival of Langley’s gray whales. 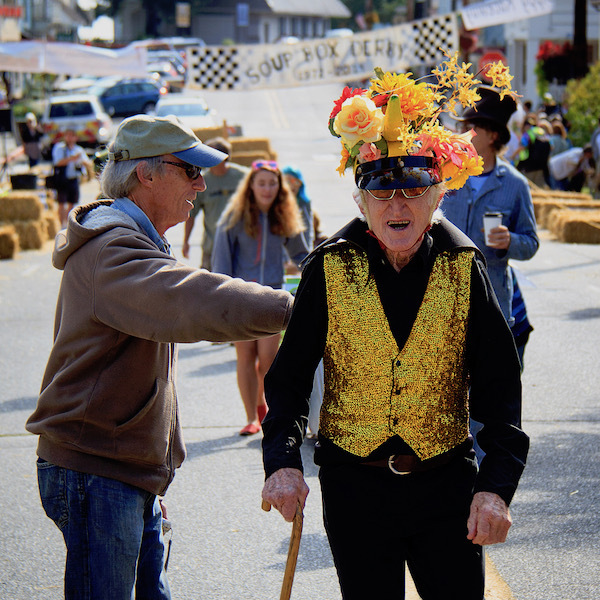 Jim Freeman celebrates Whidbey Island in its many faces. 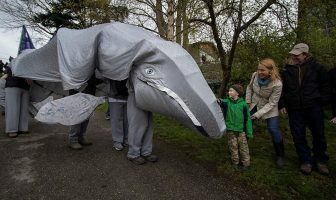 Look for him in his element this Saturday at the annual Welcome the Whales Festival and Parade. 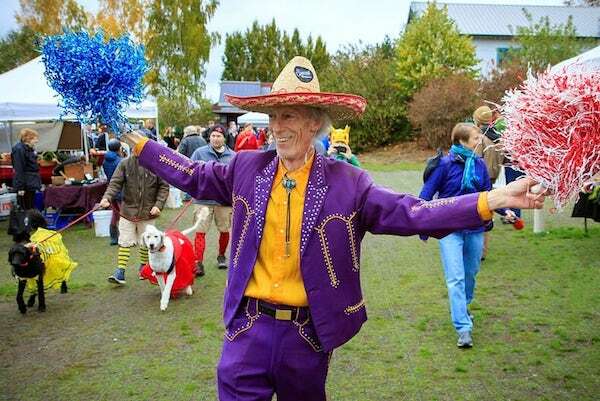 As emcee of whale and other parades, Mutt Struts, Chum Runs, Soup Box Derbies, poetry slams, and festivals, the funny man who brings us together and knows how to really connect has been honing his craft and having a great time of it for over thirty years. 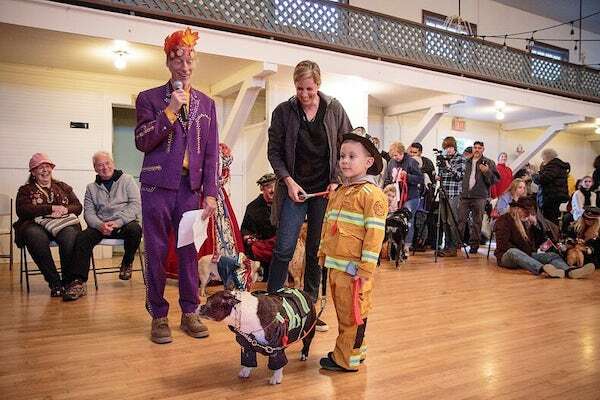 You might see Freeman this weekend in a rainbow-hued suit jacket, or wearing a whale head. Look for the man with the microphone who is making people laugh. It’s as if Whidbey Island herself summoned him here from Los Angeles so that he could be the man who made people love her. Jim Freeman is at home with kids and dogs as he emcees the annual Mutt Strut. This interview took place last week in Lone Pine, California where I was camping with my husband Bill. I phoned Jim at his caboose in Freeland. We made a phone appointment ahead of time so that he could plug in his land line and be ready to visit. “I’m drinking water out of my Lone Pine film history cup wanting to be connected,” Freeman said when he picked up the phone to say hello. Lone Pine California, northeast of Los Angeles, is the setting where many westerns and science fiction movies were and are filmed. The Museum of Western Film History is where Freeman bought his cup. He said he enjoys B-movie westerns, among other things. Freeman reminisced about how Whidbey found him and rambled here and there as befits his story-telling style. Freeman, who was raised in the Midwest and the East Coast before moving to California after serving in the Marines, said, “If you’re in L.A., you gotta go to Capitol Records. I ended up living across the street and I could look out my window and see Capitol Records (in Hollywood) and that was as good as it gets. I’m still a Dodger fan. “After law school graduation in San Diego, I worked at a law firm in Granada Hills from 1974-1978 while also traveling as an executive secretary and placement director for Phi Alpha Delta Law Fraternity, International, in addition to starting and running the Willie Nelson Fan Club from 1975-1979. In 1979 and 1980, I was on the radio in Bend, Oregon at KGRL-AM and KXIQ-FM as a disc jockey. After breaking my legs snow skiing at Mt.Bachelor in Bend, I went back to L.A. to get into comedy. I studied comedy with Stanley Myron Handleman in Venice after he had retired from touring and TV. Paul Reubens (Pee Wee Herman) was in the class before mine. Stanley gave Paul the idea to take his Pee Wee character and turn it into a stage show and morning show for kids —pretty good advice, eh? “In 1980, I auditioned successfully and was picked to work as a cast member of the L.A. Connection Improv Comedy Troupe. We performed every weekend at our theatre in Sherman Oaks while our A-team members worked as comedy relief on Joan Rivers’ short-lived Tonight Show. 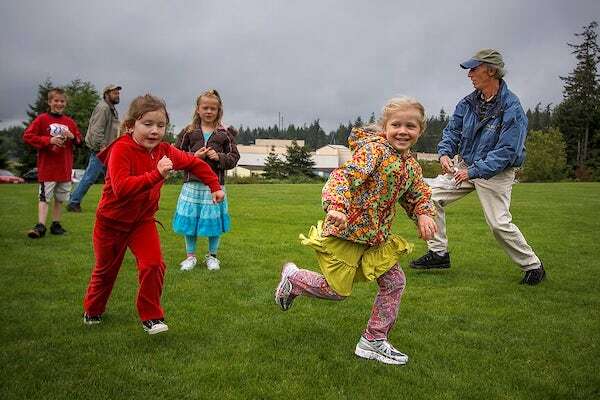 Chum Run, an annual 5K race sponsored by South Whidbey Parks and Rec., hosts its 22nd annual race this June. Jim Freeman emceed this family fun event for a few years. So Jim Freeman left L.A. and moved to Langley. Soon after he moved, Freeman stopped in at the then-popular Dog House, the now shuttered bar at First and Anthes streets in Langley. Turns out the bartender Bill Walton’s dad is the landlord for Freeman’s dad in Pennsylvania and Freeman was treated to a free beer. 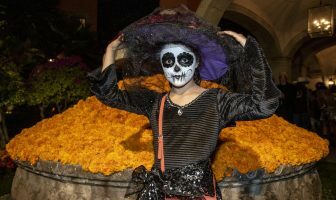 Soon afterward he met Walton’s wife, Shelley Hartle, who had been a student teacher for Jim’s 12th grade English teacher who had changed his life years ago. While practicing law is one kind of performance Freeman found another way to use his talents. Hanging out at the Dog House in its glory days found Freeman the connection to the vintage caboose he lives in to this day. Freeman said he likes to think of himself as a Conductor of Fun. And his classic train car adds to the image. 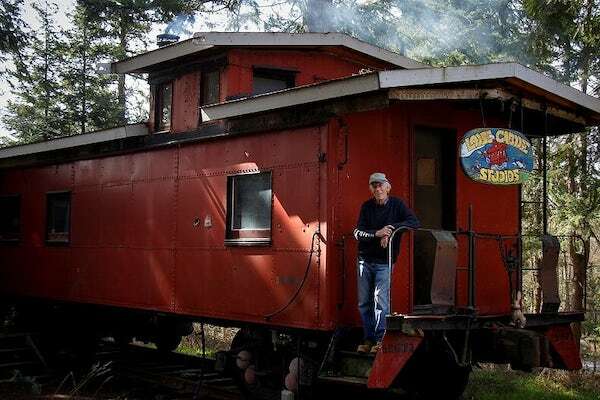 “The people I got the caboose from were second owners. I’m the third owner,” Freeman said. 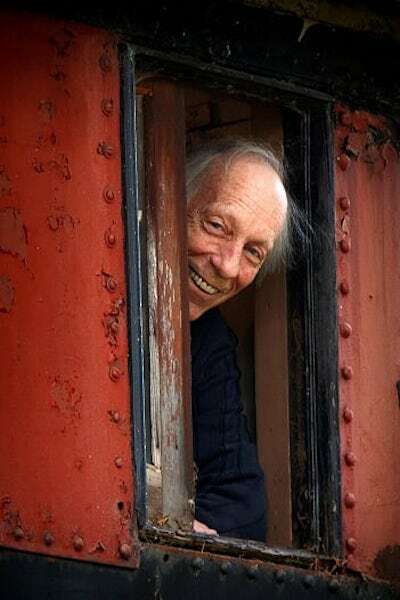 A train collector living on Whidbey lugged the tracks and caboose wheels, then the caboose shell on the ferry in late 1979. Nichols Brothers boatbuilders craned it off the 18-wheeler it was carried on. The red-colored over orange caboose is apparently a rare thing. A buddy named Bob Sandal told Freeman he needed a truck to haul his wood, not his dad’s Oldsmobile. Sandal, one of Whidbey’s “great guys,” as Freeman calls him, bought him a 1986 Chevy Durango blue truck that is driven to this day. It’s as much a part of Freeman’s personae as his caboose is. 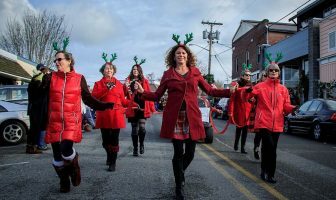 Freeman wrote for various island newspapers, including Drew Kampion’s former Island Independent and currently writes On Track, a column for the Whidbey Weekly. Freeman may write about metaphysical fish schools or reminisce about the spirit of his mom giving him courage when he’s doing comedy. He naturally brings people out of themselves. Jim Freeman emceeing the annual Soup Box Derby in a past September. He joins his friend Peter Lawlor, who races each year. What it is Freeman is part of these days is a short film coming up by local avant garde director Richard Evans about a chauffeur. Stay tuned for more from this Conductor of Fun. 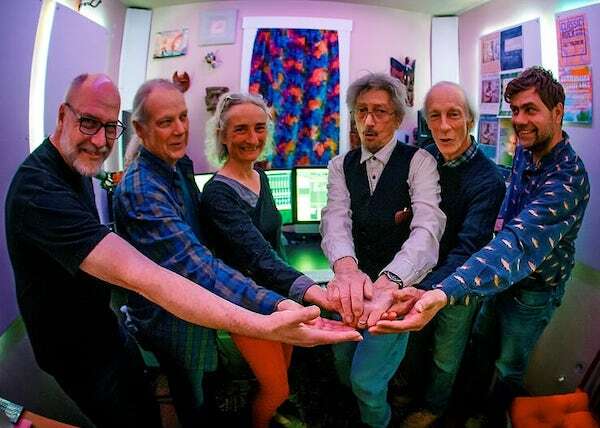 Jim Freeman, fifth from left, with director Richard Evans, on Freeman’s right. I have known Jim Freeman through a mutual friend for many years. He has a combiination of spiritual grace and quick wit that are practically impossible to find in one person> He is a person who can party with the best of them (and boy don’t I know) and be there for people in difficult times too. I am so glad to see such a well-written and thoughtful article about him. He really deserves the recognition and the largest possible group hug by all of those lucky enough to have him around. Wow, Kerry. Thanks for sending these words. I’ll let Jim know you wrote. I loved doing this story with him.